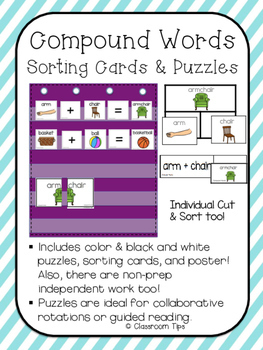 Compound words are super fun to teach and having the right materials to teach this concept is so important. WIth this download, you are getting over 35 compound words. There are regular sorting cards that make a compound word (ex: rain + bow = rainbow). 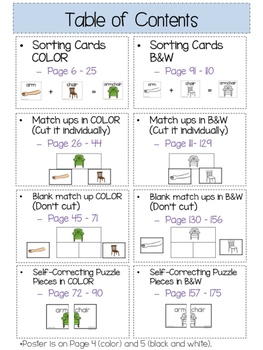 Please note, these are picture sorting cards which are helpful to our English Learner friends. In addition to that, I've included a "part-part-whole" mat of the compound words. You can use this for collaborative group rotations. There are also puzzles too! (Please refer to the cover for example). 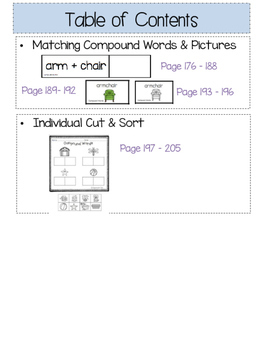 In this download, there is even a POSTER that you can use as an anchor chart to teach this concept. Again, these materials are in COLOR and BLACK AND WHITE. I find that it's so important to have everything in black and white, in case you need to make copies for kids without the quality suffering.